This assemblage if intergalactic despots is simply packed with power, and I would fear for anyone that should oppose them. Still, I think their biggest challenge would come from internal struggles - none of these villains like to share the reigns of command. It would just be a matter of time before they turn on one another. Darkseid takes the wheel. Get ready to rumble but Thanos has a tendency to completely undermine himself plus Heavy D's eyebeams would put him in place, for all his power Darth Vader is a lackey (Yea, I said it! ), Ming (?) and Khan are only human even with their armies and followers. Darkseid alone, mortals. 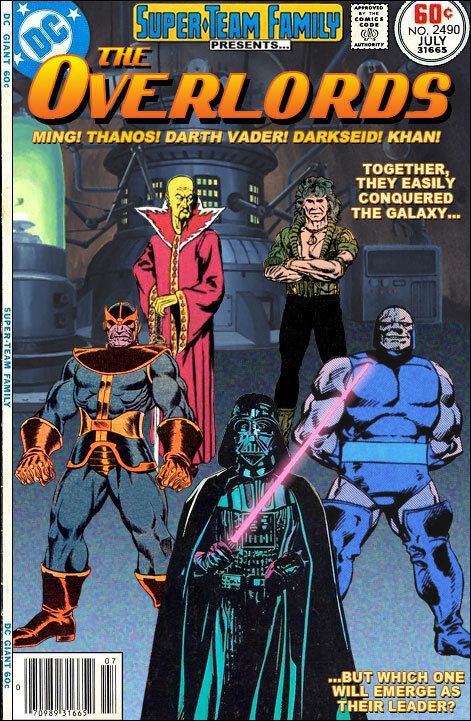 Darkseid and Thanos, maybe with assistance from Vader, take out Ming and Kahn. From there, they take out Vader. Then Darkseid and Thanos fight it out. I think it would be close but Darkseid ultimately prevails. Ming managed to control Mongo for centuries with politics, deftly turning his subjects against each other. Khan went from a test tube to dominating a third of humanity all on the basis of his personal ability. These two could plot to manipulate the two heavyweights into removing themselves. Vader would fall under their sway easily enough. Darkseid would zap Ming to atoms with his omega beams while Vader would mind-trick Khan into going up against Thanos, mano-a-mano. Only for Thanos to do to him what the Hulk did to Loki in the first Marvel Avengers film. Then, while Thanos was narcissistically mono-logging in exultation, Vader would run him through from behind with his lightsaber! By which point, Darkseid would've recovered the Anti-life Equation from its hiding place in Riverdale and used it to place Vader in thrall to him. Forever! With Ming being a variant of Fu Manchu, the classic(?) oriental-looking villain; I wonder if anyone invented an "oriental" villain (or character) called King Fu (a play on the term "Kung Fu" LOLXD (as a language joke or pun)). @ my namesake: "Plan Tzu" is the closest one to that particular target that I've heard of. Bah! You call this a collection of overlords and conquerors? These cheap charlatans cannot compare to DOOM! None but Doom is fit to be the ruler of the universe! Doom has not soiled his hands with intergalactic affairs because these catspaws have done the work for him. It is easier to conquer five than five trillion. Doom's plan is working to perfection... soon, all will bow to DOOM! Had Dr. Doom ever made headways into galactic affairs, I think he'd be an interesting catalyst with this bunch. But of course, these five are plenty nasty enough! I don't know, dude. Darkseid survived both of his previous run-ins with Vader (see STF #'s 2184 and 2343). While Vader apparently bested Doom, himself, seeing as how the former apparently gained permanent control over the latter's Doombots in STF #1009. @Carycomic: how do we know that Vader isn't actually a robotic doppleganger created by Doom after the not-so-good doctor bested _him_? Ming and Kahn could easily be replaced by Dormmamu, Apocalypse, Imperiex Prime, Galactus, or Amazo. Then, there's Vandal Savage, Kang the Conqueror, the Black Shroud (AC) and even the Silver Age Brain Emperor (Archie Comics)! This is my Synopsis: Darth Vader is a servant who has never wielded Real Power, Khan Noonien Sing is not powerful enough, Ming goes down in the 3rd round, Thanos would fall before the Anti-Life Equation. DARKSEID Rises Triumphantly (actual time could be years or centuries, maybe even shorter). "That's his synopsis and he's stickin' to it." Absolutely nothing to do with this cover, but this idea just popped into my head, Captain Carrot and the Vision. Caption 2: "Don't Miss The Most Outrageous Reboot Of All Time From The Same Folks Who Brought You The Dreaded Deadline Doom!" Marc Harkness (Any relation to Agatha Harkness (Marvel)?) are you "saying" that Wayne & Garth die because their Not Worthy, their Not Worthy? @Brother Barnes: Much less so than James. Ask anybody in the NBA! @Anonymous If you are in the NBA, I'm asking you to save on all the pa lather. To Know-o Darkseid is to Lo-Ove Darkseid and we do and we do and we dooooooooooooooooo! Personally I think Mongol belongs in that group. Or, perhaps, his Italian half-brother, Fon! Where is Skeletor when we need him most, and lest we forget Drago (Sid Haig Filmation Jason Of Star Command). @ Brother- We love you Darkseid, oh yes we do. You wield the anti-life so we'll be true. When you're away from us we're blue. Oh Darseid we love you. "Oh, Isaac, my boy! You've done it, again. Ah! Ah!" ---Jim Backus as Mr. Magoo. Magna Khan (JLI DC) would sell tickets & Mongul The Merciless would hold the event on Warworld, take 88% of the take of course (DC), but MOJO (Marvel Explore Your Universe) would have exclusive Image, Broadcasting, streaming, recording, & Merchandising rights. I'm Jack Ryder(DC) and I'm Your Announcer. *Just blue oysters. They're out of season. Imaginos is a Concept album by Blue Oyster Cult released in 1988, I bought it at WOM (pronounced Vawm) in Nuremberg Deutchland the fall of 199o. Was that the same album that featured the song about Atlantis? Or am I confusing that with someone else's album? @Cary Comic The lyric I remember from that goes like this: Imagine you was me and I was called Frankenstein, Within the song is the Chorus: World Without End, said over and over, it's more like a refrain than a chorus to my ears.